October 4th 2014 marks the 57th anniversary of Sputnik 1’s launch, the beginning of the Space Age. But ten years before that date another milestone in spaceflight was achieved. On October 4th 2004, the world’s first privately developed spacecraft, “SpaceShipOne”, rocketed to suborbital space winning the $10 million Ansari X Prize and into history. It was not the first record-breaking flight of this pivotal spacecraft, however on that day it proved private spaceflight was achievable at lower cost and could have a fast turnaround. In doing so, SpaceShipOne echoed the Orteig Prize won by Charles Lindbergh in 1927. Lindbergh made the world’s first non-stop transatlantic crossing in his plane “The Spirit of St Louis” which boosted today’s $746 billion aviation industry. SpaceShipOne’s successful flight above 100 km was the second within the 14 day window needed to win the X Prize. Like Lindbergh’s flight and the launch of Sputnik 1, SpaceShipOne was the long awaited lift off for the nascent commercial space industry achieving what was once thought to be only possible by governments and nations. As with the race to the Moon in the 1960’s a convergence of events, conditions and people created the same drive to start the commercial space race. Despite the promise over time of affordable and safe access to space, national space programs have remained at the governmental level with essentially the same launch technology, high costs and risks. These have progressively become less favourable to our increasingly risk averse administrations and the public at large. Occasionally costly accidents pushed back programs for years and took lives. For those aspiring to a future where spaceflight was commonplace, the time had come to seize their own destiny. 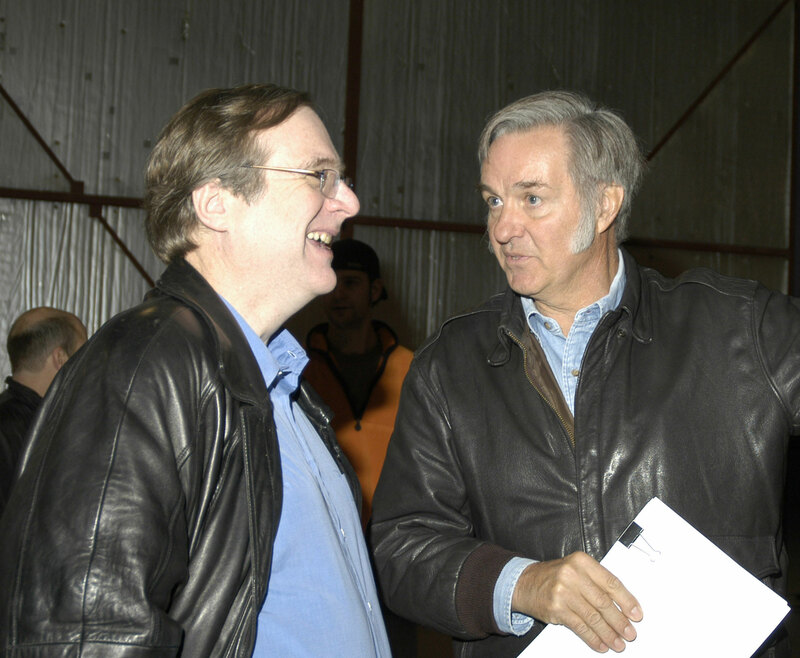 Over three decades visionary plane designer Burt Rutan had created at least one original aircraft a year including some notable firsts, such as the circumnavigatory Voyager. In the 1990s he began setting his sights higher, challenging the established approach of discarding single use expensive chemical rockets and returning to the concept of lifting bodied craft, like the X-15 in the 1960s, as a way to reach space. To that end he directed a secret project, “Tier One” through his small private company Scaled Composites in Mojave. The result was the production of a new twin boom mother-ship “White Knight” (which would be the high altitude carrier craft) and SpaceShipOne, the eventual spacecraft that would launch a new era. However getting these designs off the drawing board required funding. Microsoft cofounder Paul Allen, met with Rutan to discuss various projects. As both became acquainted with each other, Allen revealed his shared enthusiasm for space exploration and was excited by Rutan’s designs for low cost suborbital spacecraft. In 2000, Allen agreed to form Mojave Aerospace Ventures with Rutan and fund their target to reach space. Around the same time, entrepreneur Peter Diamandis, founder of the X Prize Foundation had rediscovered the Orteig Prize as a template for incentivised revolution through competition. Enlisting title sponsor and the first female Iranian civilian astronaut Anousheh Ansari, a cash prize of $10 million was announced in 2002. A new space race began attracting 26 competitors from seven countries. Scaled Composites had the head start on many of its peers before the Ansari X Prize was even announced, but winning was far from easy. Yet that is exactly what this small company did with two spaceflights within five days. The brainchild of one man, Burt Rutan, coupled with the visionary dreams of Allen, Diamandis and Ansari converged at a point in time. A point where this generation of innovators that grew up during the Apollo era decided to make their dreams of private spaceflight into a reality, rather than wait another 40 years for their national governments to do the same. For Rutan, this achievement brought him closer to the dream of floating weightless in his own black sky. Rutan’s approach with Scaled Composites was to operate as a small custom build factory. Aerodynamic designs resulted from a mix of computer simulations, flight tests and even mounting aircraft parts on speeding flat-bed trucks to take readings. 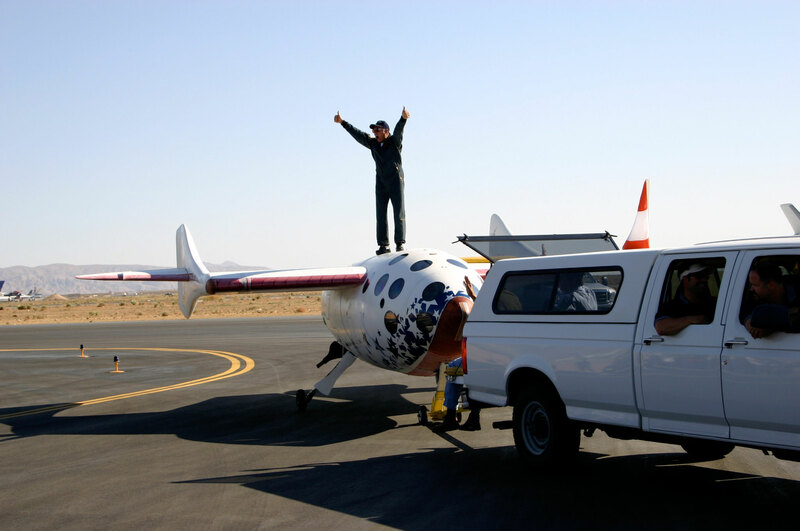 Commonalities in fabrication methods, materials and designs between White Knight and SpaceShipOne gave synergised simplicity to the creation of both vehicles. However, it was SpaceShipOne’s ingenious design that was a crucial foundation to the Tier One project. The dangers of re-entry to spacecraft were well known, requiring complex systems and high risk manoeuvres to safely traverse the atmospheric threshold. Rutan conceived a “feather” manoeuvre and mechanism which essentially folded the spacecraft in two at its suborbital apogee. This meant SpaceShipOne could stably realign itself and fall vertically back to Earth like a badminton shuttlecock would. Pilots called this a “care free” mode. As drag greatly increased through the rapidly thickening atmosphere, there were much lower structural and thermal stress build ups over a shorter re-entry window. Even at Mach 3.25 SpaceShipOne would not get as hot as a returning spacecraft would from orbit at conventional re-entry angles and super (Mach 20+) speeds. Upon descending to 70,000 feet, the feather mechanism was retracted and locked. SpaceShipOne was reconfigured as a glider and able to safely land. This distinctive feather capability was unlike any design envisioned for a spacecraft but its elegant simplicity came out of Rutan’s need to avoid re-entry tragedies of the past. Upon winning the Ansari X Prize in 2004, billionaire Richard Branson backed Rutan’s winning Tier One vehicles, base-lining his next generation fleet of privately developed space tourism craft on them. Virgin Galactic’s “SpaceShipTwo” and “WhiteKnightTwo” would continue to be manufactured by Scaled Composites under “Tier 1b” with Rutan as the Chief Technical Officer. Following the accident and investigation, Scaled Composites returned to work on SpaceShipTwo in 2008 with WhiteKnightTwo making its maiden flight later that year. By October 2010, SpaceShipTwo began glide test flights with incremental improvements to the spacecraft, safety, customer flight experience and ground based processes. 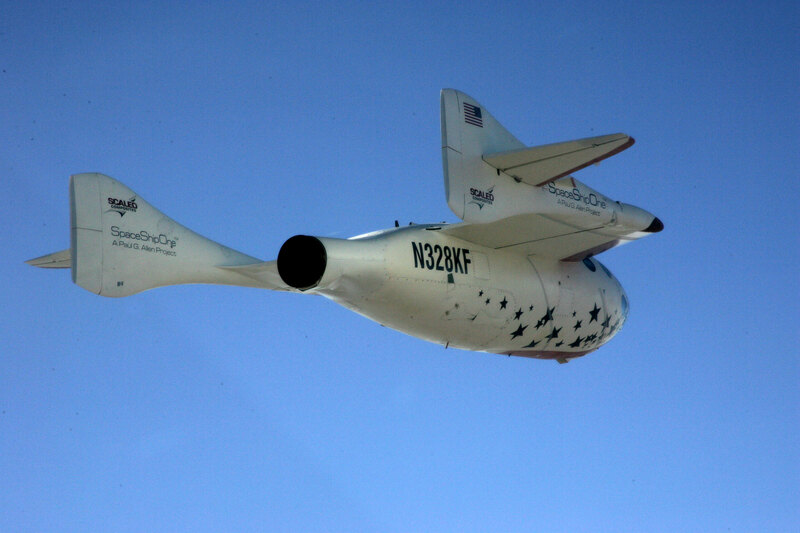 Retaining the same feathering design lineage of SpaceShipOne, its successor demonstrated this feature in flight in May 2011. Since that time the Scaled Composites team have had three successful rocket powered flight tests of SpaceShipTwo, steadily pushing the envelope to build a safe spacecraft and a compliant, sustainable spaceline for Virgin Galactic. SpaceShipOne’s successes not only opened the doors for Virgin Galactic, but also whet the appetites of those eager to claim the high ground in the new commercial race to space. As of 2014, 700 would be astronauts have signed up for a ride on the new SpaceShipTwo paying $250,000. The $50 million America’s Space Prize orbital spaceflight competition ran from 2004-10 and the X Prize Foundation has teamed up with Google to offer the $30 million Lunar X Prize. NASA has also ventured into the incentivised commercial arena with its own Centennial Challenge Prizes since 2005 looking for innovative solutions to technical issues from a wider field. They have recognised the successes in the private space sector and initiated commercial partnership competitions with companies from Blue Origin to SpaceX under the commercial development, crew, cargo and orbital transportation services programs. Many of the diverse private competitors from the Ansari X Prize are still pursuing their goals to reach space. In 2009 the $2 million Northrop Grumman Lunar Lander X Challenge top prizes were shared among Masten Space Systems and Armadillo Aerospace. Technological and private sector legislative compliance remain as hurdles to be overcome yet the boom in the private spaceflight industry continues to gather pace. Wider potential economic growth is also offered by new private prospecting, research and exploration companies. These have plans to mine off world fuels and resources to release new economies, prosperity, scientific breakthroughs and release the pressure on dwindling natural resources at home. As for the legacy of Burt Rutan and SpaceShipOne, the last decade since that historic flight has seen the expansion of technology, investment and customer appetite not just for Virgin Galactic and SpaceShipTwo but for the commercial space sector as a whole. Closer to home many Scaled Composites employees have matured through the ranks of this growing familial company and gone on to greater things. Rutan retired in 2011 but remains as founder and a mentor to other Tier 1b designers. He still maintains goals of a Tier 2 program for orbital projects and a Tier 3 program to reach other bodies in space. For Rutan, receiving a National Student Design Award in 1964 at an AIAA (American Institute of Aeronautics and Astronautics) meeting led to an encounter with Werner Von Braun which made a lasting impression. He still strongly believes that the current generation needs the courage and excitement to take risks in huge funding and technology development for massive breakthroughs and achievements as happened during the space race. Solving safety concerns and making aerospace investment profitable will be the game changing shift driving true revolution. The remarkable spacecraft itself now exists in two places. 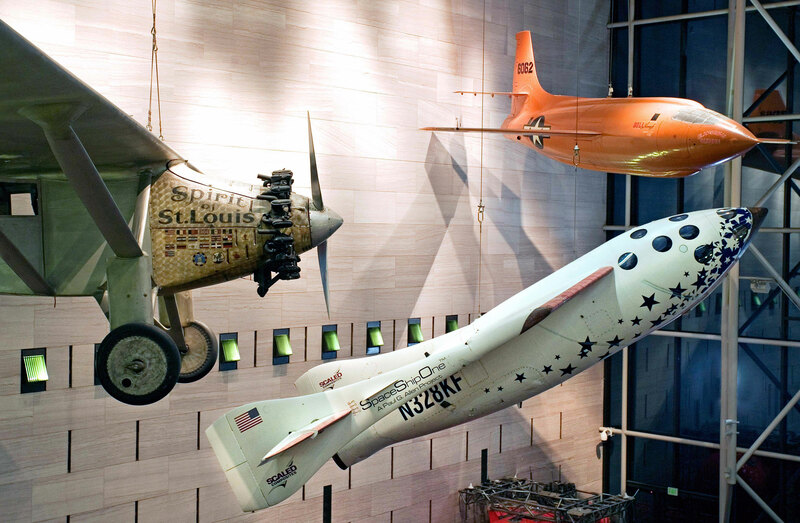 At the Smithsonian’s National Air and Space Museum in Washington DC, SpaceShipOne has taken its place alongside the sound barrier breaking Bell X-1 “Glamourous Glennis” and Charles Lindbergh’s “Spirit of St Louis”. 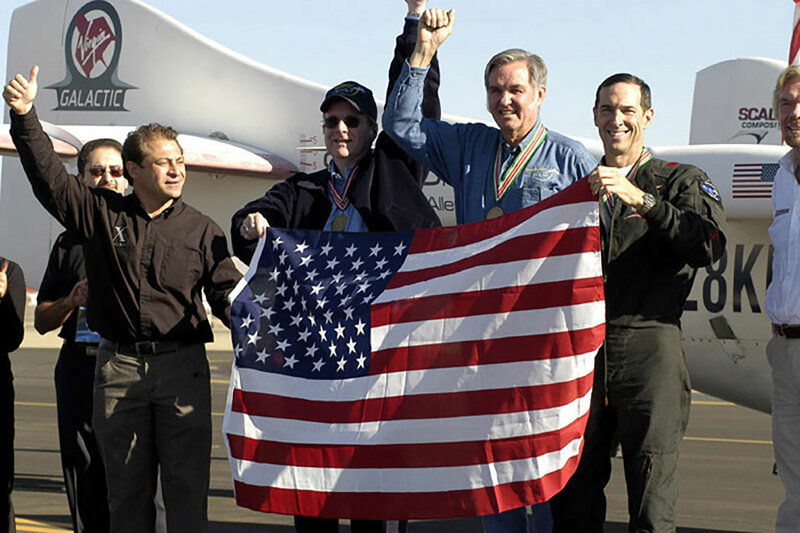 In recognition of Rutan’s achievement, the New Horizons spacecraft carries a piece of SpaceShipOne with it to a historic rendezvous with Pluto in July 2015. From suborbital flight to the furthest reaches of our solar system, SpaceShipOne is the little ship that keeps on flying higher. It and Burt Rutan’s legacies are secure in the pages of aerospace history. This article appeared in the October 2014 issue of RocketSTEM. You may download the entire issue as a PDF file here, or view the magazine online in a full-screen viewer here. Amjad P. Zaidi is an Economics graduate of London Guildhall University and a regular contributor to RocketSTEM, SpaceTweep Society and Flipboard's SpaceUnites. As a lifelong supporter of space exploration and an ardent STEM communicator, since July 2011's final Shuttle launch he has reported and presented at space conferences and events. He also participates in Space Exploration and STEM outreach with global colleagues. Amjad is on a personal mission to raise not only space awareness but also the level of STEM literacy in students and adults, as an enabler for a robust world economy and his oldest dream - pushing humanity’s final frontier back to the Moon, Mars and beyond. Copyright © 2012-2019 by RocketSTEM Media Foundation, Inc. All rights reserved.